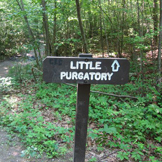 Purgatory Chasm. The Sutton Forest. Lake Singletary and Manchaug Pond. The Blackstone River. Come see what Sutton has to offer! SuttonMass.org is personally run by Lisa Shea, who has been a Sutton resident for over twenty years. She initially created this site to hold research on Sutton's genealogy and history - two of her passions. She added in thousands of photos. Over time the site has expanded to include over 10,000 pages and photos exploring the beauty which is Sutton. This site has also had a blog since 2005. Below is the latest post; click through to read past entries. Make sure you wear hiking shoes if you're heading into the chasm! This glacial cleft can reach depths of over 80 feet and has jagged rocks. Be safe! Singletary Lake is shared by Sutton and Millbury. 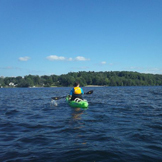 The lovely lake provides a town beach, a public boat ramp, and stunning beauty. Perfect for kayaks and canoes. Manchaug is smaller than Singletary. It hosts several campgrounds, plus a public boat ramp means wonderful access. 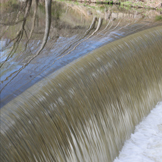 The Blackstone River provided power for our mills. Be sure to visit Tricentennial Park and the Singing Falls. Whether you like to kayak or hike, golf or birdwatch, come on by! 330 acres of water-based fun. Sutton also has a town beach on the lake. 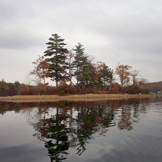 A beautiful 344 acres including several campgrounds and a public boat ramp. A stunning landscape carved out by glaciers, and featured in The Sea of Trees. Twisting nature trails enjoyed by birders and mountain bikers alike. This state reservation was once part of a fish hatchery program. Private; was once a stop on the PGA and LPGA tours. Whatever you choose to do in Sutton, keep it green! We are a Tree City!